A geothermal system uses the energy of the sun, stored in the earth, to keep you in comfort all year round. Even in the winter, when a blanket of snow covers the ground, the earth's temperature remains approximately 10?C (50?F) at only six feet below the surface. This means that you have a steady supply of heat to keep you in comfort, even in the depths of the coldest winter. The geothermal system consists of a geothermal unit, installed in your house, which is attached to a series of pipes buried in the ground. An ethanol solution is circulated through the pipes to make them highly efficient conductors of heat. The ethanol in the pipes absorbs the heat from the ground and is pumped back into the geothermal unit in the house. The unit extracts the heat from the ethanol solution, then distributes the heat throughout the house. In the summer, the whole process reverses itself. Heat is taken from the air in the house and transferred to the ground, which on warm days is cooler than the air. A series of pipes buried in the ground. An ethanol solution is circulated through the pipes to make them highly efficient conductors of heat. In the winter, the ethanol in the pipes absorbs the heat from the ground and, now warmed up, the fluid is pumped back through the geothermal unit in the house. In the summer, the heat transfer process takes place in reverse. The fluid in the pipes leaves the house in a warm state, but after circulating underground, is cooled as the pipes exchange heat with the cooler earth. The underground loops connect to the main geothermal unit installed in your house, and is connected to your home's forced air (or water radiator) system. Compatible with your home's distribution system. A forced-air heat pump delivers the highest efficiency ratings in the industry. Self regulating two stage technology allows the geothermal unit to operate at the most efficient speed for all weather conditions. Equipped with an electronic variable speed fan motor the geothermal unit controls system air flow to assure high operating efficiency and superior dehumidification. A high temperature heat pump provides high temperature output (140°F), internal controls, and factory-installed options. This includes a special high temperature scroll compressor coupled with heat exchangers designed specifically for water heating, which results in unmatched efficiencies and performance. 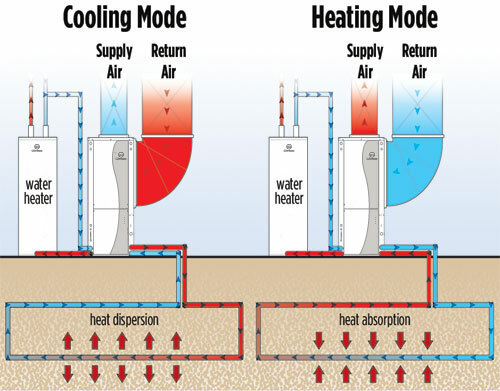 Commonly used residential applications that require energy efficient water to water heat transfer,the geothermal unit can be used to pre-heat or cool make-up air or can be installed as a stand-alone boiler / chiller in most hydronic heating applications such as radiant floors and fan coil heating / cooling. After the pipes have done the heat transfer, and the geothermal unit has done its work maximizing the heat value of the circulated fluid, the heat is then drawn off the heat exchanger in the unit and circulated throughout the house using the existing distribution system. In the summer, the process is reversed. The hot air in the house is essentially absorbed by the geothermal unit which now circulates much cooler pipe fluid. The heat is transferred first to the pipes then to the ground outside before returning, cooled, to the house. The geothermal unit is connected to the home's existing heating/cooling distribution system, whether it's gravity or forced air, water-based (typically with radiators) or water-to-water in-floor radiant. Cleaning the electrostatic filter once a month is all that's needed to keep the system in good running order. Pumps quietly circulate fluid through the heat exchanger. No combustion or forced-flame noise is heard. An outdoor air conditioning unit, often noisy, is not required. Geothermal systems eliminate indoor temperature swings and humidity changes that often occur with traditional systems. In addition, the occasional odour caused by combustion of fossil fuel will also be eliminated. Geothermal units have a life expectancy of at least 20 years. Geothermal systems use a renewable resource, the earth, which is efficient and non-polluting. Replacing a fossil fuel system with geothermal immediately cuts your household energy emissions by 50%, the equivalent of taking four cars off the road. Federal and provincial governments recognize the important role that geothermal plays in reducing home energy use, and have created rebate programs to facilitate installation.